In the next (fifth) installment of this series of six articles, PART 4: Independent Analysis Undermines NIST's New Thermal Expansion Hypothesis, the authors explore NIST's 2008 final report, showing it to be even more unprofessional than the agency's collaboration with Popular Mechanics in 2005. "NIST's December 2004 draft report"
There is no such document. I think the authors mean NIST's "June 2004 Progress Report", namely Volume 5, Appendix L ("Interim Report on WTC 7"). 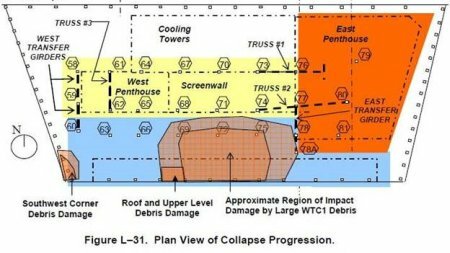 NIST's claim of a gouge in the center of WTC 7 in their June 2004 Progress Report was debunked already by "achimspok", before the draft and final reports on WTC 7 were released by NIST. K. Koenig on Wed, 04/08/2015 - 2:04pm.